For the simplified languages, see Pidgin. Pigeons or doves are the bird family Columbidae. The common names pigeon and dove are often used interchangeably. In ornithology, "dove" tends to be used for smaller species and "pigeon" for larger ones. The feral domestic pigeon is often called the "rock dove": it is common in many cities. There are more than 300 species in the family. They usually make nests of sticks, and their two white eggs are incubated by both the male and the female parent. Doves feed on seeds, fruit and plants. Unlike most other birds, the doves and pigeons produce a type of milk. It is produced in their crop, and called crop milk. Both sexes have this highly nutritious milk to feed their young. Pigeons and doves are distributed everywhere on Earth, except for the driest areas of the Sahara Desert, Antarctica and its surrounding islands and the high Arctic. They have colonised most of the world's oceanic islands. They are in eastern Polynesia and the Chatham Islands in the Pacific, Mauritius, the Seychelles and Réunion in the Indian Ocean, and the Azores in the Atlantic Ocean. The family has adapted to most of the habitats available on the planet. Doves may be arboreal or terrestrial or partly terrestrial. Species live in savannas, grasslands, deserts, temperate woodlands and forests, mangrove forests, and even the barren sands and gravels of atolls. Some species have large natural ranges. The largest range of any species is that of the rock dove. This species lives in Britain and Ireland, northern Africa, across Europe, Arabia, Central Asia, India, the Himalayas and up into China and Mongolia. The range of the species increased dramatically after it was domesticated, because the species went feral in cities around the world. It lives in cities across most of North America, South America, sub-Saharan Africa, Southeast Asia, Japan, Australia and New Zealand. 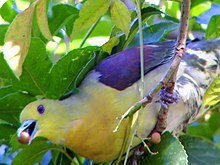 The species is not the only pigeon to have increased its range due to the actions of man; several other species have become established outside of their natural range after escaping captivity. Other species have also increased their natural ranges due to habitat changes by humans. The dodo and the Rodrigues solitaire are two famous flightless birds on the Macarene Islands in the Indian Ocean, east of Madagascar. They are extinct, but were alive before sailors found the islands. They had no fear of humans, whom they had never seen. The sailors hunted them, and killed them for food. Both species are now extinct. Animals introduced by man may also have hunted them. Their anatomy (osteology) and DNA sequence analyses show they were are in the Columbidae. In the Ancient Near East and Mediterranean, doves were used as symbols for the Canaanite mother goddess Asherah, the Phoenician goddess Tanit, and the Roman goddesses Venus and Fortunata. The Christian symbol of a dove with an olive branch in its beak represents peace and comes from Genesis 8:6 - 12, also John 1:32–34. The Christian stories came after very similar myths from earlier cultures.The Chaldean myth the Epic of Gilgamesh, Utnapishtim releases a dove and raven to find land; however, the dove merely circles and returns. Only then does Utnapishtim send forth the raven, which does not return, and Utnapishtim concludes the raven has found land. Several species of pigeons and doves are used as food, and probably any might be. The powerful breast muscles of the family make excellent meat. Domesticated or hunted pigeon were used as food in Mesopotamia, Ancient Rome and medieval Europe. It is familiar meat within Jewish, Arab, Assamese and French cuisines. According to the Tanakh, doves are kosher, and they are the only birds that may be used for a korban (offering). Other kosher birds may be eaten, but not brought as a korban. It is also eaten in Asian cuisines, such as Chinese and Indonesian cuisine. Young pigeons in cuisine are known as "squabs". In Europe, the wood pigeon is commonly shot as a game bird. Rock pigeons were originally domesticated as a food species, and many breeds were developed for their meat-bearing qualities. The extinction of the passenger pigeon in North America was partly due to shooting for food. Mrs Beeton's Book of Household Management has recipes for roast pigeon and pigeon pie, a popular, inexpensive food in Victorian industrial Britain. Wikimedia Commons has media related to Pigeons. ↑ "dove (bird) -- Britannica Online Encyclopedia". britannica.com. Retrieved 23 May 2010. ↑ Shapiro, Beth et al 2002. Flight of the Dodo. Science 295 (5560): 1683. ↑ Janoo, Anwar (2005). "Discovery of isolated dodo bones Raphus cucullatus (L.), Aves, Columbiformes from Mauritius cave shelters highlights human predation, with a comment on the status of the family Raphidae Wetmore, 1930". Annales de Paléontologie 91 (2): 167. doi:10.1016/j.annpal.2004.12.002. ↑ Kovacs, Maureen Gallery (1989). The epic of Gilgamesh. Stanford University Press. p. 102. ISBN 978-0-8047-1711-3. ↑ CHAPTER 40 – DINNERS AND DINING Mrs Beeton's Book of Household Management. Mrsbeeton.com. Retrieved on 2013-03-05. This page was last changed on 29 March 2019, at 03:32.